The great thing about the Sumobots is I could run four at once which a lot mroe fun especially considering the games I had in mind for them. Also, the outcome of any match was down to driving skill and control rather than weaponry and/or luck. 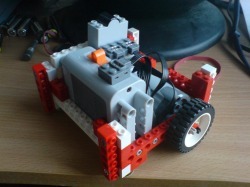 If successful, I hoped that others would want to build the sumobot. I was asked for instructions after the football match was posted. Created using LDRAW, the instructions can be seen in the video to the left. Push each other off the box - last one standing wins a point. As there are four drivers involved it's much harder to keep things under control. For example, competitors beginning when I said "go" was far more difficult than it sounds. Half of them will have fallen off the edge by that time. The very first sumo was filmed at around 2am much to the annoyance of those asleep at the time... sorry about that. 5 minutes of footage is editted out which involved me running around putting the Sumobots back onto the box whilst the rest drove straight off again. Argh! That said, this was a lot of fun and I hope to do it again soon. 2 v 2 - get the ball into the opposing teams goal to score a point. The football arena uses panels from the big arena used for the main LRW event, however this time laid onto the floor and held up with chairs or amplifiers (as I have a few lying around). The sumobots are fitted with two "spikes" each to aid in controlling the ball. The ball is actually the sphere from the Sir Killalot pullback toy. The first football match was a complete disaster. I managed to get four people together and jumped at a chance of filming. However, half of those I had recruited did not take the game seriously enough and spent most of the time grappling or destroying the goals. When an arena panel fell down I called a cease to the proceedings. I would like to do this again, but I will have to choose competitors more carefully next time!